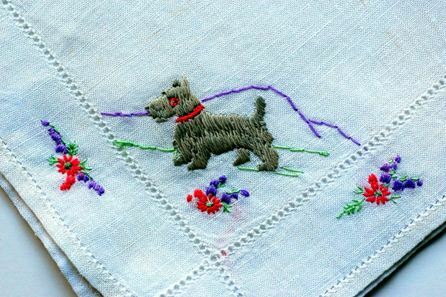 Beam Me Up Scottie …..
Home » All Blog Posts » Beam Me Up Scottie …..
to embroidered pups scampering around the border of a lady’s pocket handkerchief. 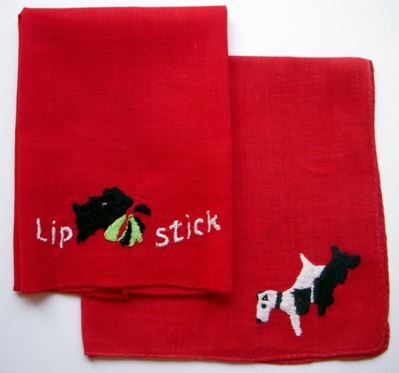 Colorful borders were a common flirtation device, and these darling little red Scotties scampering pell mell hither and yon are guaranteed to jump start any conversation. Life goes in cycles in terms of trends and popularity, whether pets, cars, music, clothing, even neighborhoods, as things fall in and out of fashion. The popularity of the tv show Lassie sparked an uptick in popularity in collie dogs in the 1950’s, while the 1930’s detective series The Thin Man featuring William Powell and Myrna Loy’s fox terrier Asta, prompted an increase in the popularity of the breed. Toto, the Cairn Terrier in The Wizard of Oz also influenced fashion for a time. 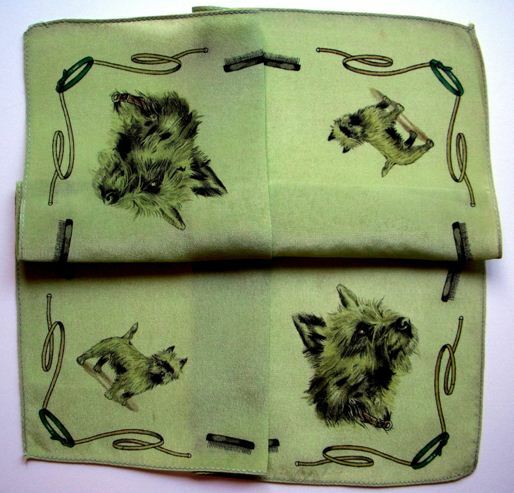 This soft moss green hankie,(which is silk, so we know it’s strictly for fashion) features a Cairn Terrier, not a Scottie, but he’s so cute, I had to include him. Even his leash, bowl and comb are included. 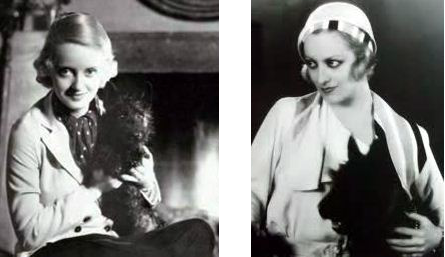 Terriers of all types were popular during the 1930’s-40’s, particularly with the Hollywood set and many a Scottie enjoyed a lavish lifestyle. 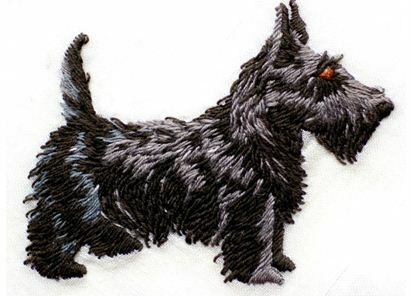 Scottie owners include Julie Andrews, Ali McGraw, Sally Struthers, Bert Lahr (the cowardly lion in The Wizard of Oz) Lionel Barrymore, Rue McClanahan, Dustin Hoffman, Marlo Thomas, Jane Wyman, Liza Minnelli, Dorothy Parker (writer and member of the famous Algonquin Round Table) E. B. White, Beatrix Potter and Rudyard Kipling. 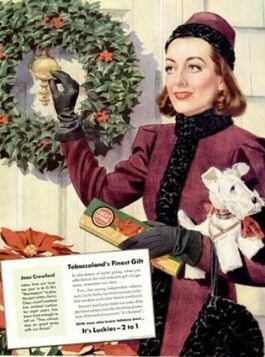 Joan Crawford can be seen carrying a stuffed Scottie in this ad for Lucky Strike, one of “Tobaccoland’s finest gifts.” Indeed, nothing like gifting a carton of cigarettes for Christmas! Hopefully, the little white Scottie is a present for someone as well. 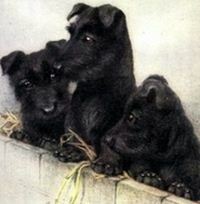 owned Scotties, along with several other breeds. 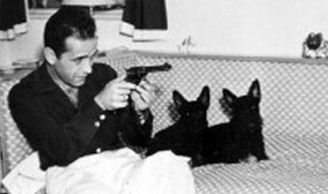 This picture is all Bogie, but also scary if you’re one of the Scotties sitting on the sofa. So here’s your trivia quiz for the day. 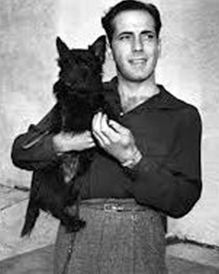 What movie established Humphrey Bogart as a tough guy? Petrified Forest in1936, where Bogart played escaped killer Duke Mantee. His 1941 role as gangster “Mad Dog” Roy Earle in High Sierra helped solidify the image of tough guy. Hard to believe, when you see him affectionately cuddling his sweet Scottie or taking pictures of his beloved pooch. One of the most famous Scotties in America lived at the White House with President Franklin Roosevelt. 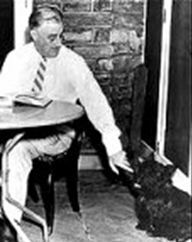 Other presidential terriers included George W. Bush’s Barney, Dwight D. Eisenhower’s Telek and Caaci, and Teddy Roosevelt’s Jessie. 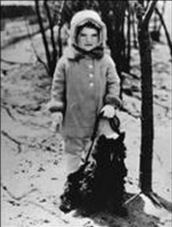 As a child, Jacqueline Kennedy Onasis had a Scottie named Hootchie. 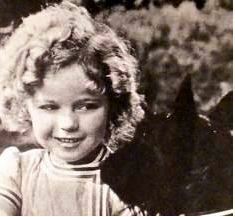 Child star Shirley Temple had a Scottie named Corky. You can see her with a Scottie in the 1935 movie Our Little Girl. 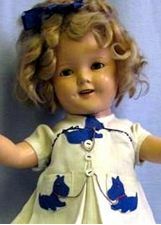 Royal blue Scotties adorn the dress of a doll made in her likeness. 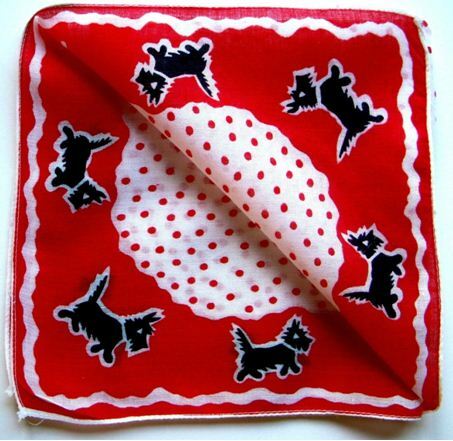 It’s no surprise then, that Scotties would be a favorite image on children’s handkerchiefs of that era. 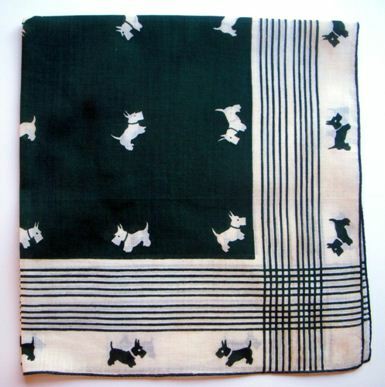 Here is a charming child’s polka dot handkerchief with Scotties frolicking around a fanciful border. 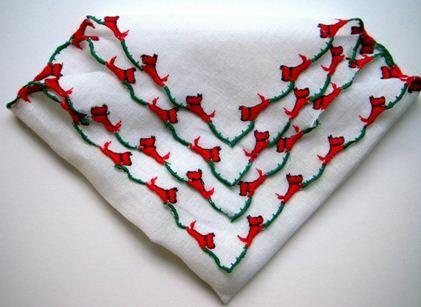 A lovely child’s hankie embroidered on fine linen. Perhaps this might be tucked in a pocket for a trip to church on Sunday. This is a perfect example of what we lost when we traded hankies for Kleenex. 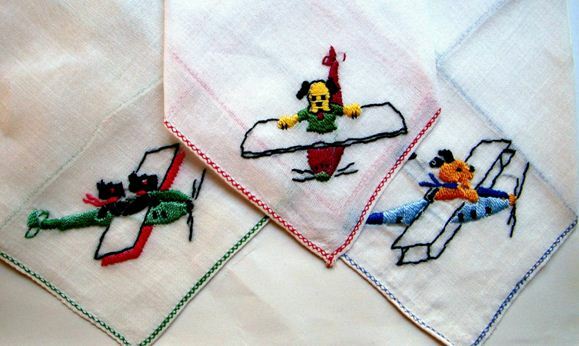 Imagine the time and effort expended in the attention to detail for something as simple as a child’s handkerchief. 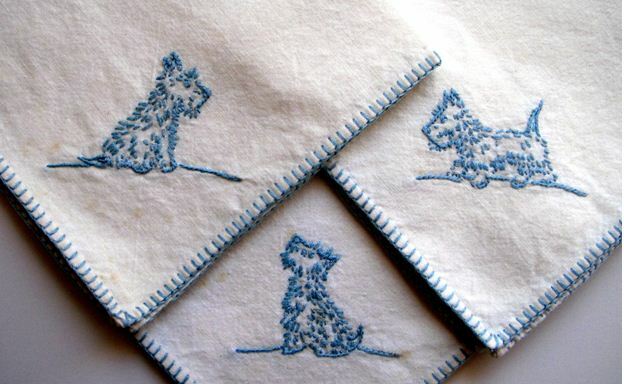 Perhaps not as professionally rendered, and execute on thick cotton cloth rather than on fine linen, is this trio of Scotties lovingly executed for some lucky little girl. It’s obvious the artist was familiar with the character of the dog portrayed. These pups are as cuddly as the soft cotton on which they reside. 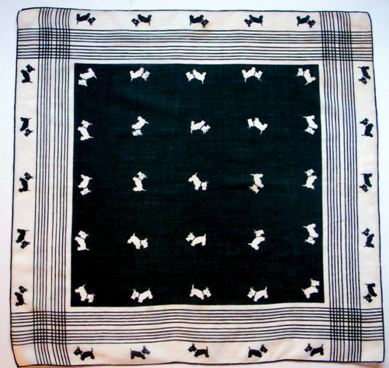 Also typical of an everyday utilitarian child’s handkerchief is this little guy begging for a treat set against a soft and subtle tartan background. 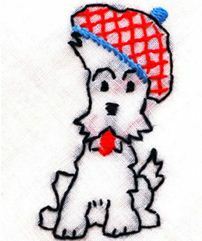 A bit more formal and professionally executed is this embroidered scottie in his tartan cap. He’s part of a children’s set sold in a lovely box. Note how the dog’s character was captured with a minimum of lines. How nice to see such care taken for something so utilitarian as a daily hankie. Speaking of tams, check out this wee Scott with the plaid bonnet perched ‘just so’. What a character! He can stay at my house anytime. The little girl skipping alongside is joined by a trio of frolicking friends. 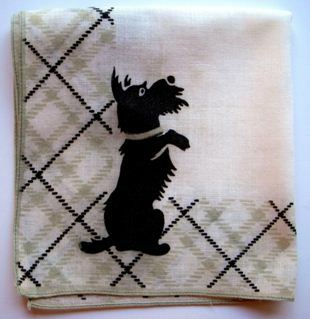 This hankie reminds me of my mother, who had a Scottie named Bonnie MacDougal when she was a little girl. 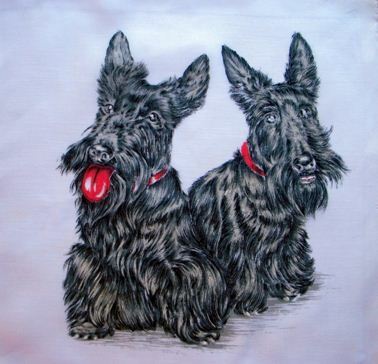 The scottie on red reminds me of another hankie adorned with the long eared scots, but for some reason, I find the image spooky, particularly the guy on the right who looks like he belongs in a scary movie. 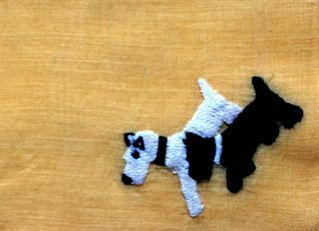 For me, at least, they are nothing like the embroidered Scottie who introduced the blog. He’s divine. Soft and cuddly, you just want to pick him up and take him home. Those warm brown eyes are so lifelike, and he sports just the right amount of shagginess. 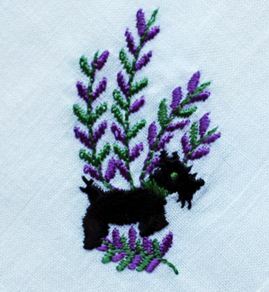 This image is actually quite small and although Scotties are usually shown in pairs, this one stands alone guarding the corner of a linen handkerchief. I’m sure he was lovingly tucked in the pocket of a kind master to roam the moors with his owner in his day. I’m so glad someone preserved this hankie. 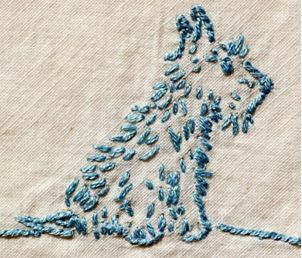 Embroidered with several different colors (not the blue near the hind quarters) he’s warm and friendly and all a dog could be. Delightful! 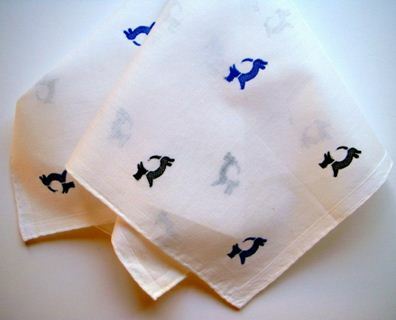 Here’s a beautiful linen number with Scotties scattered hither and yon. Once again, the attention to detail is impeccable. Every stitch fits in in perfect grid pattern on perfectly woven linen. 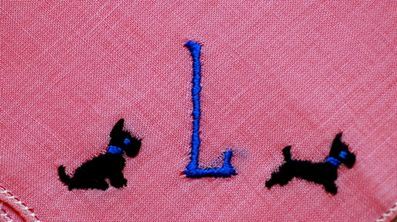 That’s not the case with our “loving hands from home” appliqued and embroidered Scotties below, but aren’t they terrific? They grace the border of a simple white handkerchief. 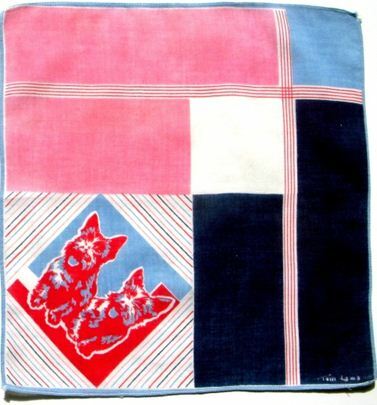 I tried to line up the images for a photo, but the blue borders are truly “crooked as a dog’s hind leg.” This trio of dogs in electric blue kennels adorn the edge of a crisp white hankie which is decades old but translates as ultra modern and hip today. These cute Scotties bookend a bright pink monogrammed lady’s handkerchief, adding a touch of both sophistication and fun. 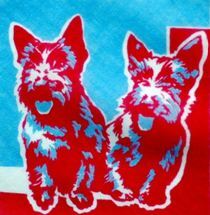 A very different interpretation in pink, these Scotties actually appear on a child’s handkerchief created by Industrial Designer Tom Lamb. Created somewhere between 60-70 years ago, they are as up-to-the-minute fresh and new as any Andy Warhol silk screen. Placed at a diagonal in this otherwise right angled Mondrian format, the use of what almost appears to be a film negative image provides extra punch. The unexpected contrast of fire engine red against the pastels make them jump off the page and demand your attention. 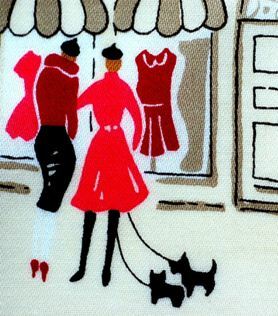 A popular accessory for the lady-about-town, Parisian women were often seen accompanied by their faithful four legged friends, so naturally, we’re not surprised to find a few Scotties among the menagerie in this Lulu Guinness hankie from France. Check out these high flying Scotties in their own biplane. They’re part of a trio of children’s hankies which have never been out of the box, so I didn’t want to remove them here. Perhaps it’s because of the Scottie profile, who knows? 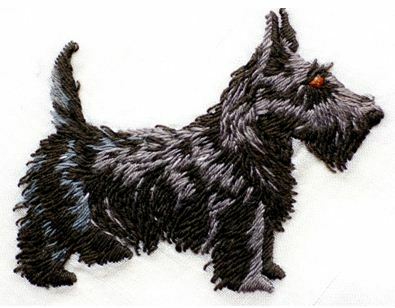 But the other dogs, darling as they are, are indistinguishable by breed, while the instantly recognizable Scottie is one sleek, smooth character. He’s the only one to have the wings of his plane delineated with extra color, and wouldn’t you know it, just like James Bond, he manages to travel with a cute girl in tow!